We were following this team for over a year now. The energy and enthusiasm mixed with professionalism and creativity is what makes this team so astonishing. 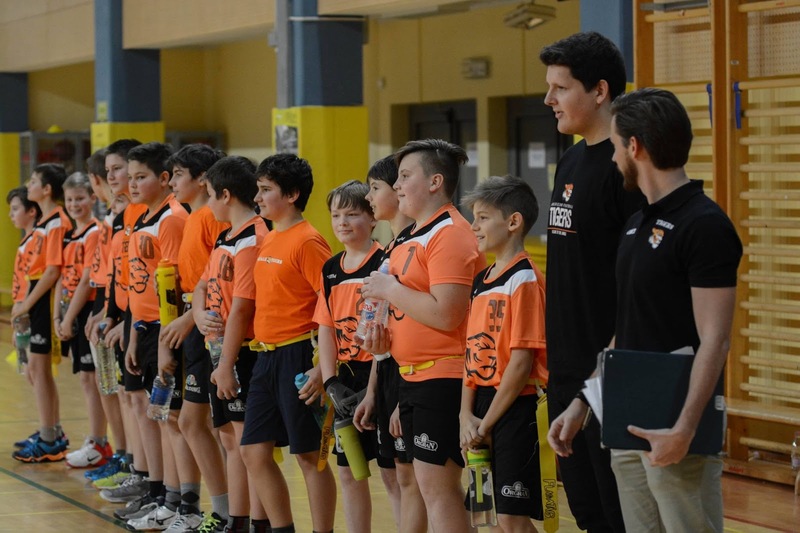 In the summer of 2015, we had a chance to sit down with Sašo Vrečar, sports director of Domžale Tigers, and just hearing the team story assured us that this will be a team we will do a cover story on in the near future. Tigers are one of the rare clubs that do everything right. But, we'll let you be the judge of that. Mr. Jernej Pavlič, team president, will tell their story. 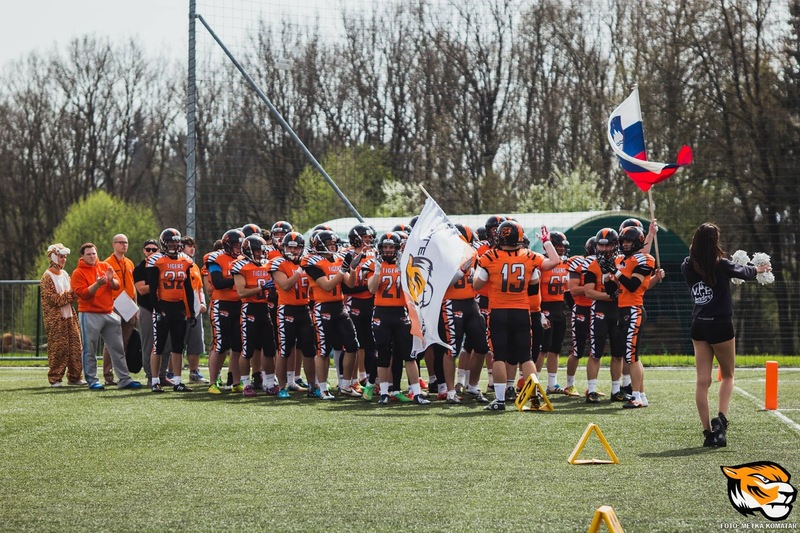 The Domžale Tigers started a bit different than teams usually kick off in Europe. Instead of gathering guys and forming a tackle program, our story begins with kids. And what a story it is! The beginnings were sort of like a Hail Mary pass to tie the game in the last seconds. Meaning, even if we succeed, we would only go to the overtime. In the beginning of 2013’s summer we decided to start a summer school of football. I asked a couple of my Silverhawks (best Slovenian football team) teammates to help out with promotion and I remember we had 7 kids at first practice at some muddy field that we could get free of charge. That was in the beginning of July and since the kids were really young, we decided to give them a mix of tackle and flag football. By the time of our 3rd practice there were only 3 kids showing up at practice and those 3 kids were coming to practices every time by the end of August. Sometimes, there were more coaches than players and the biggest challenge was to keep them entertained, since one was 10, one 13 and the other one 15. How were they supposed to compete against each other and actually have fun? So in the beginning of September I was starting to pull down the idea of coaching my own team, but wanted to at least enjoy the upcoming good weather with those 3 kids. I remember how dealing with 3 kids really helped us understand what kids want when they try out for American football. It's not about the rules, it's not about how many steps do you need to take to run a slant route. It was about catching the ball and having fun with his new teammates. This was really important for the development of the organization. The summer was ending and we got kicked off our muddy field, so we switched location to the central park of Domžale and people walking by started to watch our practices and slowly, we were getting more and more kids. I learned then that kids really want to try something new, but usually they are just to shy to do it. So to this day I am still chasing kids in the park to ask them if they want to join us for a game of flag football. And these kids were so excited after their first game, that they kept returning back for practice and in the first weekend of November, I had 25 kids at practice. I remember that awkward feeling when one of the kids asked me: “Hey coach, its getting cold outside, are we moving to the gym over the winter?” At that point I realize that we actually have a team here and I need to do something about it. Come to think of it, we got a call from the municipality, the nearby school and the police, since organized practices were illegal at local park. Kind of funny, since now schools are calling us to come there and present the sport. So the winter was here, since we had about 20 players aged from 10 to 16, I knew I can't connect them into a proper team - the age difference was too big. I firmly believe that when anyone tries football, if he tries it in perfect conditions, he will never want to stop. And that's how I treated my players - I believed that no one should quit and if he wants to, then I'm doing something wrong. So in the beginning I was really focused on not letting anyone quit the team. That means, I called everyone before practice, I called their parents if someone missed practice, I made sure everyone gets the ball and everyone is involved with the game. Those were some fun times. But the youngest of them still didn't quite like the team, since the other guys were much older. That's why we needed a solution fast and we split them into U13 and U15 selections. And that sort of philosophy helped us grow for the past 2 and a half years. After a while, we formed a male flag football team and a couple of guys insisted on really trying out with a tackle team. We said we will give a try, but in my experiences, Domžale with 10.000 inhabitants is a really a small city to form your own adult tackle team. Well, it's a good thing I listened to the team, because now, after a year and a half since first practice, we had 42 players going to training camp a week ago. And it was really the same pattern as with the kids in the beginning. A bunch of guys, just believing that they can make a team and making sure that they are having fun with their teammates. Everyone bought it for himself. We didn't have a lot of resources in the beginning, but luckily the guys were really devoted to building this team. I think one of the reasons is also that we have a really young team. In the beginning we had an average age of about 18-19 years and you can inspire people more when they are younger and motivated about a new sport like football. Literally no one had previous experiences except for coaches. At the beginning, the first 20 guys were gathered together from all different sports and I think this helped the team to develop equally. Nobody was the star player or had some sort of privileges. 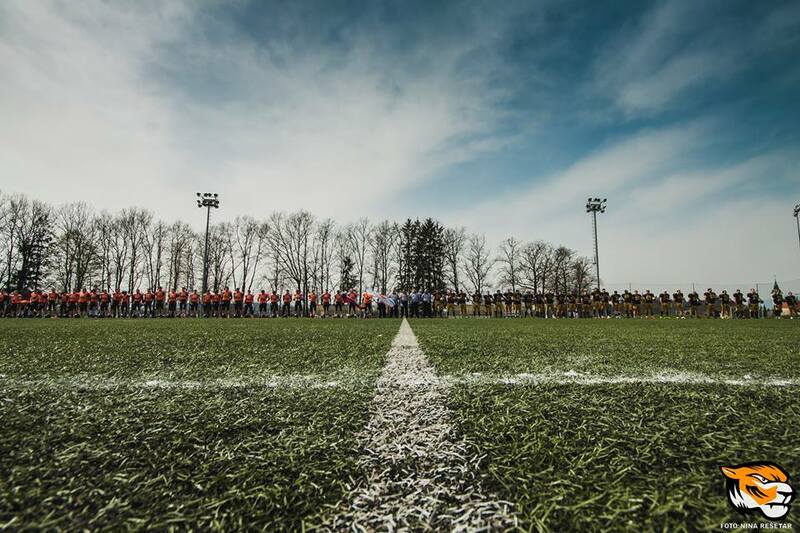 As the organization we first focused only on flag football competitions, but as soon as the tackle program became serious enough, we decided to proceed with 9man football in Slovenian 2nd league. The season was short, only 3 games with our competitors from Ljubljana and Celje, but the guys felt like they need to prove something to everyone in Slovenia, that still considered us as a flag football program. So we won all of the games and national championship in 9man football. This year we made a step further and acquired a great coach, Matic Pirnat, also the coach of Slovenian national team, who will lead us this year through 1st Slovenian league and also CEFL with the first international debut. I believe the Tigers are all about the people. From the first practice back on that muddy field with 3 players until practices with 45 men on the field, everyone is really devoted to make the newcomers, rookies and everybody else to feel as a part of something. We really believe that together we can achieve everything and hopefully that spirit will lead us into one of the biggest organizations in our region. We have rookie talent shows, picnics and make sure that all of the parents also mingle with each other. We’re building a community, not just a team of football players. We try to get involved everywhere that we can. A couple of months ago we donated more than 300 toys to the Childerns hospital. We also organize a lot of school presentations, we made a donation of football equipment to a local school and in general want to participate in all local activities. This year we wanted to clean snow in front of the local people, but the winter was too soft. Considering we started only 2 and half years ago, the support is amazing. We have more and more people getting involved with the organization and we are giving a special emphasis on including parents into our activities (like monthly meetings, including them into homecoming preparations etc.). So far, we hosted 2 home games and in both cases we had over 400 fans and supporters showing up, which is huge for sports in general in Slovenia. I think it is a result of really taking the time and explaining to the local people on what American football is all about. We make about 20 school presentations each year and we try to present the rules of flag football at every big local event. I think the only way to succeed in a local community is when people actually understand what football is all about. It's not so much about the quality of the team in the beginning as it is about just giving people enough information on how football is played, what are all of these American expressions, why is the game stopping all the time and of course, the classic, how is this different then rugby. You need to be really tireless about this. We also have a branded vehicle and try to get monthly published articles about the organization and the sport of football. Also, we did a lot of promotion on Facebook in the beginning. Every new team in a local environment gets a certain momentum and you want to use that as much as you can in the beginning. The first year really taught me how literally everyone is important when you are trying to build an organization. In the first year we managed to build the team to about 70 members with mostly flag football selections. To build that you need everyone's volunteer will and a lot of devoted time and energy to really work with people. That can be players, rookies or coaches. I believe that the best coach should be dealing with rookies all the time - because they need the most attention to get started. What I also learned is that you can't mix players of different age. You make a new selection as soon as you have 4-5 players of the same age and then push everybody hard to get another 3 or 4 in the next two weeks. Everybody really feels like they contributed to the team like that and you can grow really fast like that. Time will tell if we made any mistakes in our first year, but so far I believe that we made all of the right decisions. Now, that we have more then 200 members with 130 actively practicing, we are focusing to establish a holistic approach to developing players. To have players from young age listening to the same route names, same football patterns. We are trying to establish something sustainable, that will help everybody grow to another level. Also, we had some challenges with the management structure at the point when we came to more then 70 members. We are trying to be focused and professional about our work for the organization, so we only accept really responsible people to be included into the management team. We sort of have everything covered, from coaching tackle and flag football, to running PR, Marketing, Administration and events and everyone needs to know their responsibilities at all times. This group of people, Jure, Anja, Sašo, Jernej, Matija and Matic really deserve all the credit. Some don’t have any football background, but they are really devoted to what they do. Usually, new teams are being ran from people that are close friends, which I don’t think ends up with anything good. We are on a mission here and although we are good friends, I think we take ourselves more as colleagues. This becomes really important at a certain phase, otherwise the daily activities and the organization can outgrow you. I also know now that you need sponsors (laughing), a lot of sponsors. And the best way to attract them is through parents of your players. Because if you keep them close enough, if you work with them, talk and listen to them, they will be your biggest supporters and the ones that will go out and ask companies for donations. Probably what we should have done differently is include parents even more. We actually had a moms flag football team a year ago and are thinking about establishing it back. In the future, we will continue with developing elementary school teams. We have 10 elementary schools in our region and we want to have an academy of 10 teams that will eventually compete against each other. 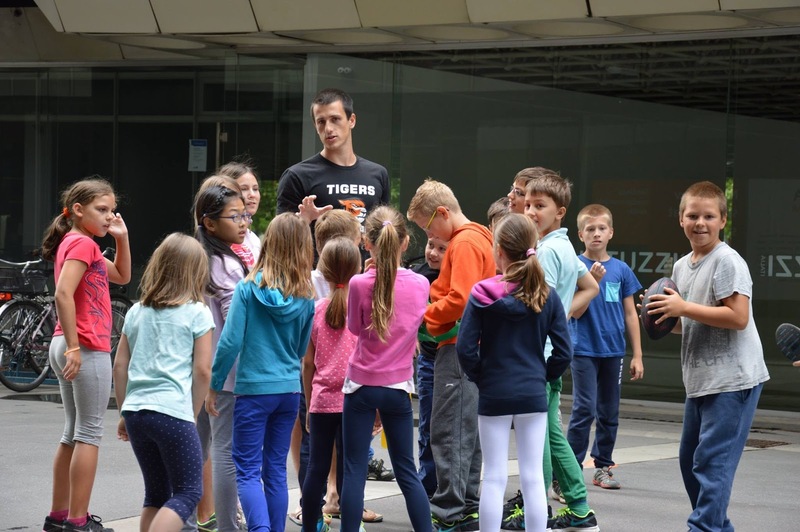 We already built two school programs, called the Rodica Lions and Radomlje Jaguars that have successfully introduced football to kids on two schools. Also, we are going to focus more on the womens flag football. Girls can be absolutely amazing about how serious and devoted they can be about the team. They are our loudest fans and we will continue with adding youth women selections to the organization. I think flag football is really crucial for introducing the sport to the local community. So, to be honest - it was a one long shot, a long Hail Mary pass that day when we decided to go to the central park just to make it to the overtime and to this day I still feel like we are winning.